Impressive email campaigns are an essential part of your marketing strategy, but the place where your customers land after clicking through is of equal importance. Landing pages on eCommerce sites come in many shapes and sizes, but the most effective amongst them are clear, succinct and consistent, and with an obvious call to action. Consider reading these tips when planning your landing page content. Creating Landing Pages – A technical job? Typically, Landing Pages are created by a technical team, with merchandisers providing information about the products. But what if it were possible for the merchandising team to react to news items, changes in the market or analytics by creating and managing Landing Pages without the need to involve IT colleagues? What if they could very quickly (we’re talking minutes) create a Landing Page and have dynamic control over which products they promote? 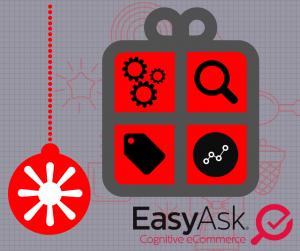 EasyAsk’s Search solution provides a complete solution to the landing page problem, with the ability to create the whole page, not just a list of products. With its unique use of Natural Language Processing, merchandisers can quickly define products they want on the Landing Page and then add content such as banners, scrolling banners and videos. One of the key advantages of EasyAsk’s Search Solution is its ease of use and flexibility, meaning that knowledge of the catalogue and market is more important than technical knowledge – and we think that this is the way it should be. A merchandiser can use Natural Language to define a set of products, for example, “leather sofas over $2000” and then assign these products or searches to an attribute value, e.g. “Living Room Luxury”. As a merchandiser, you can see the products dynamically as you change the search terms in EasyAsk’s interface, Commerce Studio. It is also possible to select individual products. Is there a cold spell forecast? Send an email with a link to a ‘Snow Jackets’ landing page. Is there lots of talk in the news about cyclist safety? Start a ‘Be Seen at Night’ email campaign that leads to bright-colored products on a landing page. EasyAsk makes it easy for customers to define what their searchers see on Landing Pages and to therefore respond to analytics or campaign directives. The Landing Page functionality can be used not only for one-off campaigns, but for run-of-the-mill marketing, for example providing links to several Landing Pages from the weekly email to customers. With the effective combination of a merchandiser’s knowledge of a catalog and EasyAsk’s Natural Language Processing, Landing Pages can be created and managed dynamically, keeping your business ahead of the game and in touch with your customers.